BAT appeared to be gearing up for a bull run early this morning after the asset banked a 2.23% gain against BTC and managed to break above a six-day psychological resistance at 4,000 Sats. However not long after this pump occurred, the asset ran into a strong downtrending resistance at around 4,162 Sats - having already failed to break above this level earlier this month. Hopes that the breaking news from Taiwanese electronics giant, HTC, yesterday would encourage a late resurgence of BAT support today, are starting to look unlikely as the asset has already begun to unravel its earlier gains. Right now, the asset is holding on to a marginal 0.67% against BTC and trying to stay in the green. Will this turn out to be just a correction phase or will bears succeed in driving BAT back down to its lower supports? Let’s take a look. On the 1D BAT/BTC chart, we can see that the asset has been range-bound between the 3,941 Sats and 4,236 Sats level for most of this week (green shaded area). Historically, these two levels have been key support and resistance areas for the asset - particularly on October 25, prior to the Coinbase Pro listing pump, where the 4,236 Sats level held down the first surging bull run. 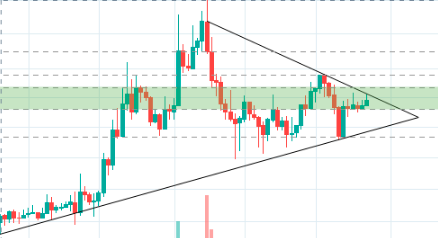 In the image above, we can also see that BAT is consolidating inside a large pennant pattern, between a clear downtrending resistance level and a strong uptrending support line that links back to lower lows reached in September this year. When BAT suddenly crashed -10% last week, this uptrending line was able to catch the falling price action and allow bulls to relaunch back above the 3,941 Sats support. Right now, the asset is struggling to successfully test the downtrending pennant resistance for the second time this month. The long wick above the current 1D candle suggests that bears are starting to mount an offensive at this critical level and drive the bulls back down to the lower support. On the 1D indicators, we can still see a number of bullish signals suggest that buyers remain in the control of the asset over a broader time period. Over 2H candles, however, the chart indicators have suddenly turned favorably bearish as selling pressure starts to weigh heavy on the current uptrend. -The 2H RSI has fallen by -10% as bearish momentum increases. -On the CMF, the indicator line has dipped back towards the zero line below as buying pressure diminishes. -On the MACD indicator, buying candles on the histogram have started to shrink towards the signal line and the 12MA has already begun to arch toward the 26MA below. -On the Parabolic SAR indicator, we can also see that the first dot has just appeared above the price action, which is indicative of a bearish trend reversal. From this, it appears likely that we will see BAT correct from this morning’s pump and potentially return back to the 4,000 Sats support, or the main range support at 3,941 Sats below by the end of today. If bears continue amping up the selling pressure, we could expect to see the asset break further down to the uptrending pennant support, before bulls get their next opportunity to recover. From here, we could see BAT continue consolidating between the uptrending support and the downtrending resistance until the asset is finally able to break out. All returns on investments (ROI’s) and losses are calculated from BAT’s current value of 4,070 Sats (at time of writing).